Autumn certainly arrived in Manchester on Sunday as a full house huddled up against the cold and damp before being left unfulfilled when the first Twenty20 was abandoned seven balls into England's chase. However, for the home side it looked like a reprieve after Australia's new ball pair of Brett Lee and Mitchell Johnson rattled the top order. Joe Denly's Twenty20 debut couldn't really have gone much worse - a dropped catch and a first-ball duck - while Ravi Bopara's problems outside off stump continued with a flash to slip. The Australians were pumped, with Johnson enjoying some heated banter with the crowd, and Lee eager to put weeks of frustration on the sidelines behind him. For Australia this period of one-day action is about moving on from the Ashes defeat, but also about building a side for the World Twenty in West Indies next April. Cameron White, on his return to side, staked a huge claim with the innings of the day and will aim for a repeat on Tuesday. Hopefully, too, there will be a chance to see Dirk Nannes in action. England are also plotting and planning having never settled on a Twenty20 side. The bowling unit was impressive in the opening match - although Stuart Broad's round-the-wicket attack isn't convincing - but they need to hold all their catches. Denly's miss off White on 12 could have been the difference if the first game had gone the distance. Brett Lee He was quick the other night. Very quick. There is pent up frustration to be let out and England's top order could be in for a pounding. He won't always be economical in Twenty20 (his over on Sunday included a no-ball and a wide) but he can make early inroads. Even fielding on the 15-yard circle at slip felt too close, White felt. Luke Wright He is England's utility player in this side and has been moved down the order to add some kick to the late-over assault. He had his moments opening in the World Twenty20, but the selectors feel he can provide power later in the innings. Only bowled the one over, however is a lively option for Paul Collingwood if conditions suit. His dropped catch was a rare blemish in the field. There seems little reason for Australia to change their side after little more than half a game, even though the batting struggled for momentum until the final five overs. Callum Ferguson could be an option for the middle order, but the current line-up are worth another chance. Australia (probable) 1 Shane Watson, 2 David Warner, 3 Michael Clarke (capt), 4 David Hussey, 5 Cameron White, 6 Adam Voges, 7 Tim Paine (wk), 8 Mitchell Johnson, 9 Brett Lee, 10 Nathan Hauritz, 11 Dirk Nannes. England's latest opening pair will get another chance while the bowlers all did a decent job in restricting the Australians. After the impressive performance of Collingwood's cutters an extra spinner may be considered, but the three frontline quicks all offer something different. England (probable) 1 Ravi Bopara, 2 Joe Denly, 3 Owais Shah, 4 Jonathan Trott, 5 Paul Collingwood (capt), 6 Matt Prior (wk), 7 Luke Wright, 8 Stuart Broad, 9 Graeme Swann, 10 Ryan Sidebottom, 11 James Anderson. The surface was a little two-paced for the first match with the quicks getting the ball to fly, but the slower bowlers also proving hard to score off. However, once again the main concern is the weather with more showers forecast for Tuesday evening. And there's also the effect of the floodlights to consider. Bring your brolly and a warm jacket. 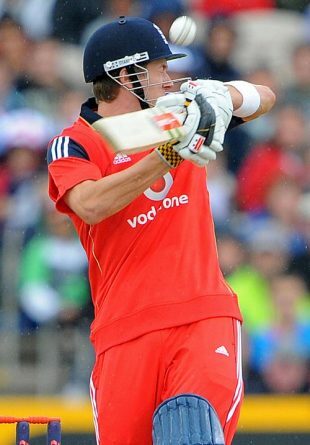 Joe Denly and Ravi Bopara were England's 13th opening pair in 21 Twenty20 internationals. They also lasted the shortest amount of time together - three balls. Cameron White's 55 from 36 balls was his first Twenty20 international fifty. "They have three 90mph bowlers and that's something we are going to have to deal with." Paul Collingwood knows England face a challenge against Lee, Johnson and Nannes. "I couldn't adapt straight away cause there was a bit more pace and bounce and obviously they were targeting one area of more so I had to adapt. Hopefully tomorrow I can get a bit more of a free rein so I'm looking forward to it."